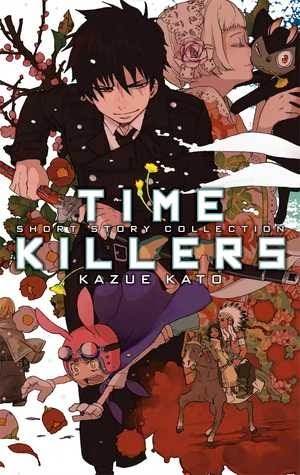 I haven't read Kazue Kato before, but Blue Exorcist has been on my tbr list for ages. The art in this collection of shorts is absolutely beautiful. She is a first-rate manga artist. The stories are all dark, depressing or weird; my kind of stuff basically. The first story is pretty dark and I really liked it. About an assassin and the son of a doctor he attacks who become friends in a strange way. The next story has rabbits and the message in the end is we all have to move forward no matter what heartbreak we face along the way; we can't live in the past. Later on a short where mommy beats up daddy, ok.... moving right along a princess wears paper doll clothes with tabs which means she shows up naked from the backside view. Back to being serious with a short but sentimental story of a homeless dad whose daughter almost dies from illness until he starts his own business. ... haunting mysterious sea creature. Then along comes a fantastic story featuring space aliens about the meaning of life and a decidedly strong Christian message. Finally, the book ends with the first Blue Exorcist one-shot which is totally excellent and now has moved up further on my tbr list.